A randomised, single blinded (effects analyst), multi-centre study on the efficacy of L. reuteri DSM 17938 in children aged 3 – 60 months, and treated in their homes for acute diarrhoea for five days. 29 children were randomised to the L. reuteri group and 31 to the control group. Both groups received conventional rehydration therapy, but the control group received no probiotic. Compared to controls, duration of diarrhoea was significantly reduced, and at 48 hours 55% of the children were free from diarrhoea vs. 13% in the control group. From the 72nd hour of intervention, there was no difference between the two groups in the percentage of children with watery diarrhoea. No study-related adverse events were reported. This was a controlled, randomised, single-blinded, multi-centre study in 127 children, 3-60 months, and hospitalised for acute diarrhoea lasting 12-72 hours. The study objective was to assess the effect of L. reuteri DSM 17938 (Protectis) on children hospitalised with acute non-bloody diarrhoea (acute gastroenteritis), as an adjunct to rehydration treatment. The patients received five drops per day (10^8 CFU) of L. reuteri Protectis (n=64), for 5 days, as an adjunct to, or ORS / intravenous rehydration alone. Primary outcome was measured as duration of diarrhoea (hours). Secondary outcomes was measured as duration of hospitalisation (days), number of children with diarrhoea on each of the study days, proportion of children with prolonged diarrhoea and frequency of daily stools. Results showed that duration of diarrhoea was reduced by 33 hours compared to the control group. 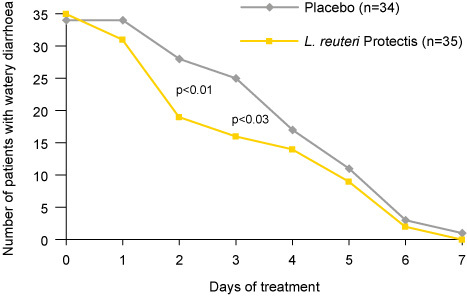 The advantageous L. reuteri Protectis effect was seen already 24 hours after start of intervention. The mean length of hospital stay was shortened by 1.2 days compared to the control group and prolonged diarrhoea after 7 days was only observed in the control group. Lactobacillus reuteri effectively reduced the duration of acute diarrhoea and hospital stay in children hospitalised with acute gastroenteritis. This prospective and open trial investigated whether L. reuteri could affect the duration of diarrhoea in adults with HIV infection or AIDS. One hundred patients consecutively admitted to a Romanian university hospital or a centre for HIV treatment, 19-62 years old, and with mild to moderate dehydration were included. They were randomised to the active group given L. reuteri DSM 17938 (1×10^8 CFU/day) in addition to rehydration therapy (n=50), or the control group receiving rehydration therapy but no probiotic (n=50). Patients in both groups were also treated for the diarrhoea-causing infective microorganism if such was diagnosed (bacteria, fungi or parasites), which was the case in 74% in total. The duration of diarrhoea was significantly shorter in the L. reuteri group compared to the control, 2.08 days and 2.92 days, respectively (p<0.001). After one day of treatment 18/50 (36%) of the patients in the L. reuteri group were free from diarrhoea vs. 6/50 (12%) in the control group (p= 0.01), on day 2 they were 68% vs. 44% (p=0.016), and on day 3 the result was 92% vs. 70%, respectively (p=0.01). Conclusion: L. reuteri was well tolerated, and it reduced the duration of diarrhoea significantly compared to the control group. The use of L. reuteri as an adjunct to antimicrobial treatment of different gastrointestinal infective agents optimized the treatment response and reduced discomfort in these HIV/ AIDS patients. A prospective, randomised and placebo-controlled study investigating the effect of Lactobacillus reuteri ATCC 55730 in children hospitalised with acute diarrhoea (rotavirus in 40%). 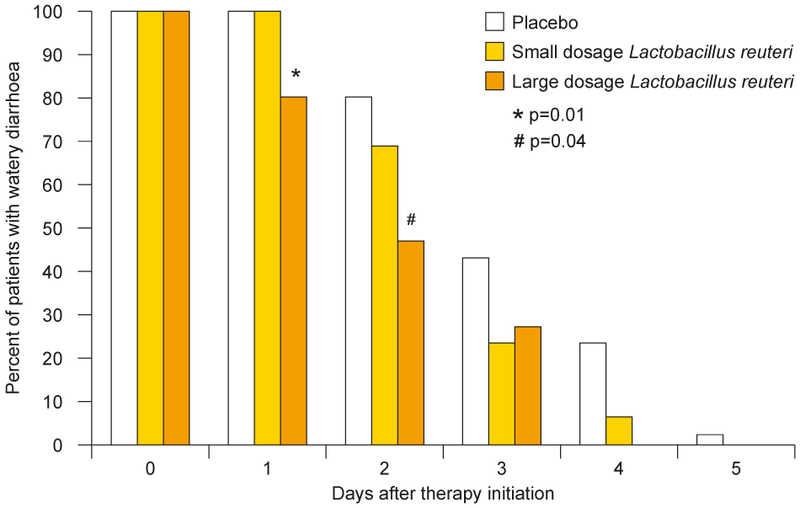 Fifty children, aged 6–36 months, were randomised to receive Lactobacillus reuteri twice daily in a dose of 10^8 CFU for the length of the hospital stay or for up to 5 days, or a matching placebo. Both groups received standard rehydration therapy. 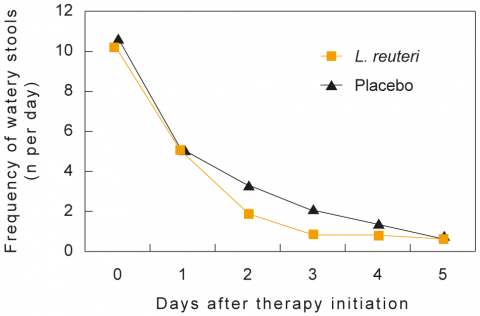 The mean duration of watery diarrhoea after initiation of therapy was 2.3 days in the Lactobacillus reuteri group vs. 2.9 days in the placebo group. On the second day of treatment significant differences in effect were shown for: watery diarrhoea (persisted in 64% in the Lactobacillus reuteri group vs. 84% in the placebo group), mean frequency of diarrhoea (1.9 in the Lactobacillus reuteri vs. 3.4 in the placebo group) and vomiting (persistent in 16% in Lactobacillus reuteri group vs. 40% in the placebo group). Conclusion: Lactobacillus reuteri was effective as a therapeutic agent in children hospitalised with acute diarrhoea. A prospective, randomised and placebo-controlled study of 66 children, aged 6–36 months, who were hospitalised due to acute diarrhoea caused by rotavirus. The children were randomised into three groups: placebo (n=25) or Lactobacillus reuteri ATCC 55730 in a daily dose of 10^7 (n=20) or 10^10 CFU (n=21) for up to five days. All three groups received standard rehydration therapy. From the second day of treatment, 30% of the children given the lower Lactobacillus reuteri dose were free from watery diarrhoea, compared to 52% of the children given the higher dose. The difference was significant for the high-dose Lactobacillus reuteri group compared to the control group, in which 20% of the children no longer had watery diarrhoea. The high-dose group also had a significantly shorter period of watery diarrhoea: 1.5 days on average compared to 2.5 days in the control group. For the low Lactobacillus reuteri dose group, the mean duration of watery diarrhoea was 1.9 days. Fig. 1 Percentage of patients with persisting watery diarrhea in the groups receiving placebo (n=25) and small (n=20) and large (n=21) dosages of Lactobacillus reuteri. Conclusion: The administration of Lactobacillus reuteri in the dose of 10^10 CFU per day significantly shortened the duration of watery diarrhoea in children hospitalised for treatment of acute diarrhoea. The low dose of 10^7 CFU almost reached significant effect on duration of watery diarrhoea. A prospective, randomised and placebo-controlled study of 40 children, aged 6–36 months, who were hospitalised due to acute diarrhoea (caused by rotavirus in 75%). The children receiving active treatment were given Lactobacillus reuteri ATCC 55730 in a daily dose of 10^10–10^11 CFU for up to 5 days (n=19). The Lactobacillus reuteri group and the placebo group (n=21) both received standard rehydration therapy. A significant effect was apparent from the second day of treatment, when 74% of the children in the active group were free from watery diarrhoea, as opposed to 19% of the children in the control group. Conclusion: Lactobacillus reuteri appears to be a promising therapeutic agent for treatment of acute gastroentiritis, particularly rotavirus-associated disease, in young children. The therapeutic potential should be explored futher for possible practical clinical applications. In addition, Lactobacillus reuteri may have other beneficial health effects, including prevention of diarrheal disease.